Feel the authentic hospitality of Kyoto through the delicious and seasonal cuisine of hamo (conger eel) and Kyoto vegetable dishes served at Tazuru. Tazuru is able to accommodate any number of guests from a couple to a large group of 40. Day-time Yuka seating is available in May and September, and night-time yuka is available all through May to the end of September. 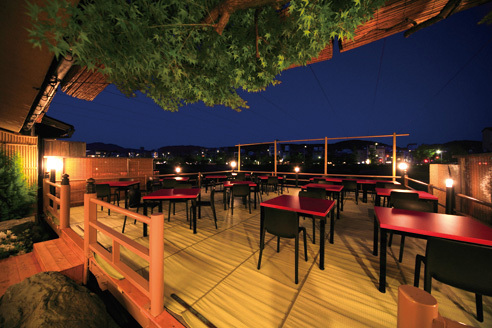 Enjoy the cool evening breeze of the Kamo River from the same Yuka decks where it is said that Sakamoto Ryoma once gazed upon the summer night sky. ※ Day-time Yuka available only in May and September. 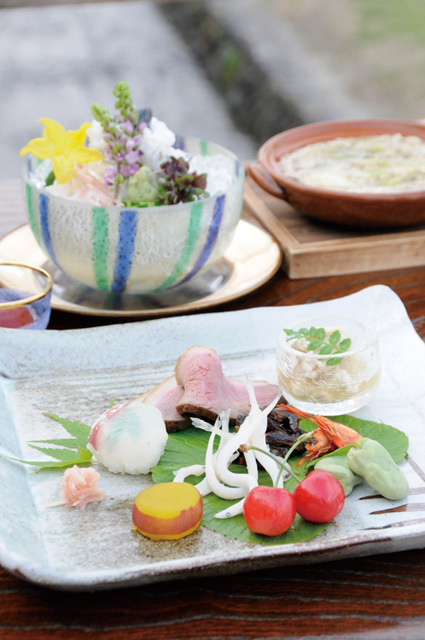 A perfect collaboration of French regional cuisine and Kyoto's vegetables.